Cash (also called Kemps or Kent) is an interesting social card game for four to eight players. Players form two-player partnerships, competing to make four of a kind, then successfully send and receive a secret signal without it getting intercepted by their opponents. The object of the game is for one player of the partnership to call out “Cash!” upon receiving a signal from their partner that they have obtained four of a kind. Alternately, notice that one of the opponents is attempting to signal their partner, and call out “Counter cash!” before their partner calls “Cash!”. All players divide into pairs. The game is best with four players (two partnerships), but can be played with six (three partnerships) or eight (four partnerships). Players may mutually decide a method for determining partnerships, which may be as simple as merely selecting who they would like to be paired with, or by some random process. One such method for a four-player game is to remove two red and two black cards from the deck, shuffle them, and deal one to each player. The players receiving the red cards play against the two with the black cards. Seating arrangements must take care to allow all players to be clearly visible to one another, and partners should not sit directly next to one another. Prior to the game, each partnership excuses themselves to a secluded place where they are unable to be seen or heard by any other player. They then agree upon a secret signal, which can be a hand signal, innocuous action such as taking a drink or tapping the table with your cards, or a verbal phrase. Signals that might be unintentionally sent, like scratching your head or rubbing your eye should be avoided! Cash requires one 52-card deck of playing cards. Since players will be quickly grabbing for cards, you don’t want a flimsy deck of cards that will get easily beaten up. 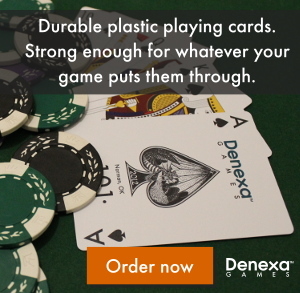 Denexa 100% Plastic Playing Cards are made to last and are sturdy enough for even the most rambunctious games. Shuffle and deal four cards to each player. 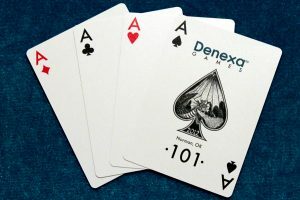 Then deal four cards face down to the center of the table, forming the board, and place the deck stub in front of the player to the left of the dealer, forming the stock. 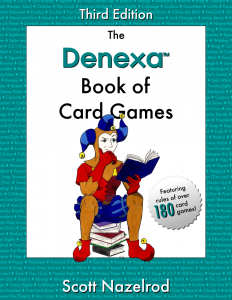 The dealer calls, “3…2…1…GO!”, then turns the four board cards face up. Each player may then grab whatever board cards they find useful, take them into their hand, and discard back down to four (returning the board to four cards). There are no turns! If two players grab a card at the same time, whoever touched the card first (or whose hand is on the bottom!) is entitled to it. Play continues, with players swapping cards out as they see fit, and refreshing the board as necessary. Whenever a player achieves four-of-a-kind, they send their secret signal to their partner. When the partner notices the signal, they call out “Cash!” (or “Kemps!”, or “Kent!”, or whatever the name of the game is). All players reveal their hands; if the player whose partner called “Cash!” does, in fact, have four-of-a-kind, that partnership wins. However, if there is no four-of-a-kind, they lose. If a player suspects at any time before “Cash!” is called that an opposing partnership is signaling, they can call “Counter cash!” The hands are revealed, and if a four-of-a-kind is present, the partnership that called “Counter cash!” wins (but, as with cash, if there is no four-of-a-kind, calling “Counter cash!” loses). Some players play that the losing team receives a letter in the word “CASH” (or “KEMPS” or “KENT”, as appropriate), and that whichever partnership spells out the word first loses the match. Otherwise, play can continue indefinitely, with each hand standing alone as a separate game. Partnerships are given the opportunity to change their signal between hands, then all cards are shuffled and new hands and a board are dealt. A real deal is when the stock runs out without “Cash!” or “Counter cash!” being called. In this case, the hand is a draw. If the game is being scored where partnerships receive letters for losses, no letters are received for a real deal.